The camera is designed to detect all-sky auroral morphology in multiple wavelength bands at extreme low light conditions. A twin instrument is installed at the Chinese Arctic Yellow River Station in Ny-Ålesund. The distance between Ny-Ålesund and Longyearbyen (~120 km) is ideal for triangulation to determine auroral altitudes and borders. The Monochromatic Auroral Imager of the Polar Research Institute of China (PRIC). 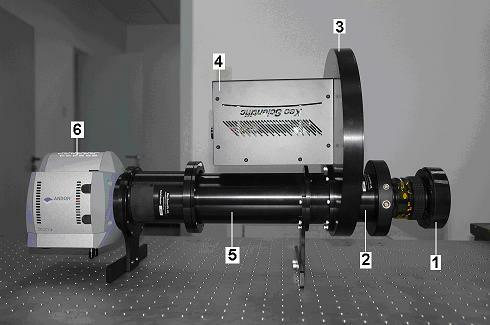 (1) Mamiya 645 24mm/F4.0 Fish-eye lens, (2) collimator lens, (3) filter wheel, (4) Smart motor system, (5) relay optics, and (6) EMCCD detector. [CH4] 557.7 nm, [CH5] 620.0 nm, [CH6] 630.0 nm.